Continuing with the October theme of Cyber Security, iDrive presents eight tips to make your online experience more safe and secure, and to help prevent identity theft on social media. As an iDrive Agent, you can share these tips on social media, too! 1. Be selective with what you share. Since we’ve grown up in a world where sharing our personal lives online is pretty much the norm, it easy to forget how public social media can be. Do you really want the world and the online service to know everything about you such as name, grade, school, hometown, family members, birthday, jobs, names of pets? How much you share is entirely up to you, yet the more you share the more you risk. 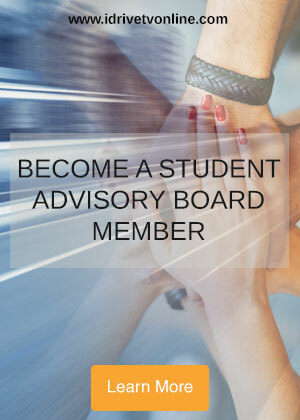 Moreover, sharing certain information can lead to bigger problems. For instance, if you post your phone number in a comment on Instagram with the best intentions to help a friend in need, remember that other people can see it. Not only might you expose yourself to harassing phone calls, someone might be able to piece together the name that you share on your social profile, your phone number, and your social media handle or e-mail address, and possibly to steal your identity or commit crimes in your name. Excited about your new driver’s license? Your jump for joy could turn into a puddle of tears if you share a picture of your new ID on Instagram, Twitter or other social platforms. Drivers licenses and official IDs are like gold to a criminal as they reveal the name, address, date of birth, photo, official state-issued identification number. How about that new (to you) car? Before you share your bliss with the world, make sure that your license plate number isn’t showing in the photo. 2. Set your account to private. The most obvious way to keep your information and personal details tucked away from the public eye is to set your account to private. Information in public social media accounts are visible to anyone and everyone, and your profile, posts and pictures may also show up in a Web search. If that doesn’t creep you out, search for yourself on a site like Spokeo or Pipl.com. These sites compile all of the social media accounts related to an individual. If your account is set to private, the public has limited access to your information. Just remember that nothing shared online or through electronic devices is ever completely private. So, if you set your account to private but accept friend and follower requests from unknown users, you may undermine your own efforts to safeguard your information. While the request from an unknown person might be enticing to accept–especially after taking a peek at that good-looking profile photo–the intentions, and even the authenticity of the “person,” are difficult to verify. Be advised that fake accounts are commonly used to get a hold of user information. If a photo or username is provocative, it could be a social bot built to seem like a human, but beware, these bots are built to hack into your account, take over your identity and spread malicious or explicit content that can ruin your reputation and even impact your friends’ security. Speaking of friends, another red flag raises when you receive a duplicate friend request. Have you already connected with a friend from school on social but receive a second request from the same person through a different account with a different username? Note that it might be an imposter. You can double-check by inquiring about the follow request from the duplicate account when you see your friend at school or by reaching out to him or her through a text message. Your pal may even thank you should the account turn out to be fake since his or her account could have been hacked. Thirdly, social media accounts of celebrities are often created by fans, but they could be imposter accounts set up for harmful purposes. Fake celeb accounts can also put you at risk for social spam and malicious links. You can check to make sure that the account is “official” by cross-referencing the celeb’s other social media accounts and by visiting their official website. The little blue badge on sites like Facebook and Twitter also help indicate whether the account is official. So, before you hit “accept,” ask yourself: Is this account real? How do I know that I can trust this person with my information? Sometimes, it’s better to hit “deny.” You may meet some awesome new friends on Instagram, Twitter, Facebook, and Snapchat, yet limiting your followers to family and friends that you know in person does help to prevent yourself from connecting with malicious social media accounts. Learn more about “social engineering Tip 5. Social media is full of crazy quizzes that ask silly questions such as “What is the color of your personality?” or “Discover your spirit animal,” or quizzes that tell you what type of character you most resemble in a TV series or movie. While these quizzes sound like an entertaining and harmless way to pass the time (while eliciting a few laughs from friends as you share the results on your social feed), these sites might collect and sell your personal information to ad companies, and they might even give hackers access to your information. This is the perfect formula for someone that wants to exploit your information: they know what you like, what interests you, they have your full name and any other information that you provided in the quiz. Before you take a quiz that beckons, for example, “Which type of Thanksgiving food are you?” consider your personal security. Phishing e-mails are often easy to spot: Weird syntax, obvious spelling errors, requests from “old friends,” strangers asking for a few hundred dollars sent by money order, etc. However, some may be disguised better than the rest. You may or may not be tempted to click on an e-mail saying you won a free cruise vacation, but keep in mind, some e-mails can infect your computer or mobile device with a virus just by clicking on the link. Phishing scams happen on social media, too. Links shared in a social media post or in a direct message (DM) from a friend can be malicious. This tactic is called “social engineering.” Hackers know that people are more likely to trust links shared by friends. The malicious link shared in a DM or post can lead to a phishing website: when you click on the link, you are directed to a page that is almost identical to the login page of your social network, but watch out. It is most likely a spoofed site built to trick you into entering your login and password. Hackers get a hold of your security token when they collect your credentials. By the way, that social media post that invites you to claim your $1,000 gift card by entering your e-mail, name, phone number and the contact information of five of your friends–is most likely a scam. Just remember: if it sounds too good to be true, it probably isn’t true. Be aware of social engineering and phishing scams. 6. 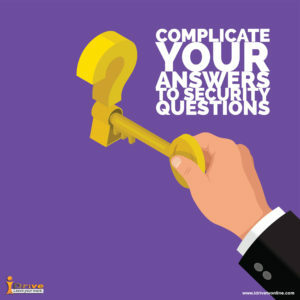 Complicate your answers to security questions. Answers to questions such as “What is your mother’s maiden name?” can easily be found out if a hacker found your Facebook page, or another online account, that shares this information. The same holds true for your hometown, high school and the name of your pets, so consider answering these questions with a more varied series of letters and numbers. Here’s how. 7. 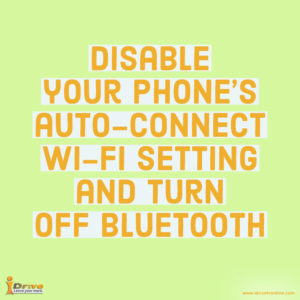 Disable your phone’s auto-connect Wi-Fi setting and turn off Bluetooth. Mobile devices can be hacked and infected with malware and spyware through public Wi-Fi or a hacker connecting to your phone through Bluetooth. To reduce the risk, make it a habit to tap off Wi-Fi and Bluetooth. Why have it on when not in use anyway? Not only will you save battery power, you’ll better protect your data from eavesdroppers that snoop for information in highly populated places that offer wireless hotspots like coffee shops, shopping malls and airports. Turn off the automatic connection setting for Wi-Fi on your phone, and turn off Bluetooth when not in use. 8. Share these Security Tips on Social Media! You can help to prevent identity theft by sharing these security tips with your friends and followers on social media. Download these images to your computer or device and share on Facebook, Twitter and Instagram. Tag us @idrive_live! By the way, this blog post is shareable, too, so please do! Sharing is caring! Hey, iDrive Agent! How do you keep your information secure? 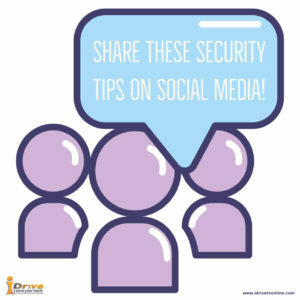 Add your security tips to the iDrive conversation about #CyberSecurity and #IdentityTheft on social media!